Salmon are indigenous to both the east and west coasts of North America. There are several species that inhabit western waters, with chinook salmon being the most abundant. In rivers of the east, the Atlantic salmon is predominant. Salmon are anadromous, meaning that they swim up rivers from the sea at certain seasons for breeding. When it is time to spawn, salmon return to the stream of their birth, also known as the natal stream. The adult salmon die shortly after spawning, with the decomposing carcasses of the adults providing essential food and nutrients for numerous stream creatures, including young salmon. Thousands of years ago, Native Americans along the Pacific and Atlantic coasts of North America were building societies that revolved around the salmon. The salmon became their means for survival, commerce, and an important part of their religion. Because the salmon migrated on a cyclic basis, so too did the Native peoples whose lives revolved around the fish. Some permanent villages were established on or near waterways, or at sites of waterfalls or rapids, where the fish could be easily speared or dip-netted. * Other villages would travel from far inland to their traditional fishing grounds along the rivers. The rights to these fishing grounds were passed down from generation to generation. Their journey had to coincide with the arrival of the salmon, and their fishing success depended on the size of the salmon run. The total human population that relied on the salmon supply of the lower Columbia River is believed to have been approximately 100,000 people. 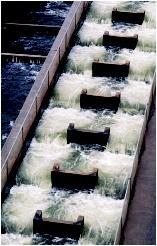 Fish ladders are one method of helping migrating fish ascend rivers blocked by dams. Ladders often are designed and manufactured for specific types of fish, and with regard to the geotechnical and hydraulic conditions of the site. With the advance of civilization across North America and settlement of the fertile river valleys, the fate of the historic salmon runs was sealed. Salmon harvesting became big business, as salmon was less expensive than other meats. Arrays of techniques were designed to capture large quantities of salmon for processing and canning. Commercial fishermen used long nets to seine the rivers and estuaries . Horses were often used to haul the salmonladen nets onto the riverbanks. Another unique invention was the fish wheel, which was a river-powered water wheel with baskets that would scoop the migrating salmon out of the water and deposit them in a waiting boat. Some wheels were mounted on the backs of boats, making them mobile fish scoopers. The fish wheels could operate day and night with minimal maintenance. 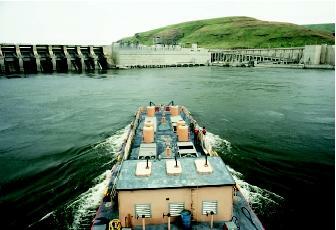 By the time the dam-building of the mid-1900s began, salmon populations already were in decline. The dams, however, put an end to the gigantic salmon runs. In the late twentieth and early twenty-first centuries, the salmon dilemma has become increasingly complex and controversial. On the east coast, for example, the situation is critical. In 1990, New Brunswick's 108 salmon rivers supported healthy native Atlantic salmon runs. Ten years later, all are in decline and fewer than half have wild salmon populations at or above levels required to ensure survival. The Miramichi River was the world's largest and most productive Atlantic salmon river; yet now, less than 1 percent of the salmon return to the river to spawn. The Atlantic salmon situation in the United States is also severe. Once, most rivers north of Connecticut were teaming with salmon. Today, it is estimated that only 50 to 100 native Atlantic salmon will return to a half dozen rivers in eastern Maine. A combination of factors contribute to the continuing decline of salmon. On the west coast, it is widely accepted that the most important factors that affect salmon are the "four Hs"—hydropower, habitat, harvest, and hatcheries. With the presence of dams, salmon are unable to ascend to the spawning grounds of their natal streams, and juveniles are hindered from migrating downstream. Redfish Lake in Idaho's Sawtooth Mountains historically would receive hundreds of thousands of bright red adult Sockeye salmon returning to spawn via the Columbia River system. Now only one or two fish may be observed reaching their annual destination. Habitat loss to urban growth and degraded watersheds from generations of farming and logging has left spawning grounds choked with pollutants and silt. Fishing activities (harvest) are putting further strains on salmon stocks. Hatchery fish sometimes are interbreeding with native species, modifying the population's genetic characteristics. To help reduce mortality of juvenile salmon as they enounter dams and hydroelectric turbines on their downstream migration, fisheries managers and biologists transport critical populations in barges and trucks. Juvenile fish transportation programs represent only a small component of the larger strategy to assist the recovery of salmon populations. easily, allowing these chemicals to build up in downstream waters. Heavy, late-spring spraying of forests with a pesticide laced with nonylphenol during the 1970s and 1980s prompted biologists to investigate its role in salmon decline. On a global scale, the effect of changing ocean temperatures is speculated to have a connection to the number of salmon returning to spawn. Scientists believe the continued decline in native Atlantic salmon numbers appears to be caused by increased mortality in the ocean. Possible explanations are the depletion of the salmon's normal food source by commercial fisheries. While debate continues over causes of salmon decline, efforts are being taken to assist in recovery. The spraying of pesticides containing nonylphenols has been stopped on eastern forests and habitat restoration programs have begun. While pollution, dams, and runoff from farms and logged forests have ruined many spawning rivers, scientists believe there is still enough freshwater habitat that can be nurtured and improved to produce reasonable numbers of fish. In the Pacific Northwest, making changes that affect any of the four Hs is challenging because each has a powerful constituency that tries to protect its own interest. Accordingly, much of the debate in salmon recovery reflects power struggles and politics rather than biological considerations. The greatest benefit to salmon would be the removal of dams, which block salmon migrations. Though some small dams are being removed, any proposal for the removal of the large hydroelectric dams on the Columbia River system will be hotly contested for years into the future. Numerous federal, state, and local government agencies are working with private landowners and citizens to initiate watershed enhancement projects aimed at improving spawning habitat. Moreover, agencies are now looking closely at the role hatchery fish should play in maintaining harvestable and sustainable populations of salmon and what priority should be assigned to each river's unique native salmon population. Since spawning salmon return only to the rivers of their birth, it is difficult to introduce salmon from one river into another. Once a river's native population is gone, it is gone permanently. SEE ALSO Chemicals From Agriculture ; Dams ; Ecology, Fresh-Water ; Ecology, Marine ; Endangered Species Act ; Fish and Wildlife Service, U.S. ; Fisheries, Fresh-Water ; Fisheries, Marine ; National Oceanic and Atmospheric Administration ; Nutrients in Lakes and Streams ; Pollution Sources: Point and Nonpoint ; River Basin Planning ; Runoff, Factors Affecting ; Stream Ecology, Temperature Impacts on ; Stream Health, Assessing ; Watershed, Restoration of a.
Cone, Joseph. A Common Fate: Endangered Salmon and the People of the Pacific Northwest. Eugene: University of Oregon Press, 1996. Mills, Derek. Ecology and Management of Atlantic Salmon. London, U.K. and NewYork: Chapman and Hall, 1989. Shearer, W. M. The Atlantic Salmon: Natural History, Exploitation and Future Management. New York: John Wiley & Sons, 1992. Atlantic Salmon Federation. <http://www.asf.ca/> . The Oregon Plan for Salmon and Watersheds. <http://www.oregon-plan.org/> . The Oregon Plan for Salmon and Watersheds is one of many efforts to save salmon populations. The Oregon Plan's goal is to restore the health of Oregon's natural aquatic systems. It brings together government, interest groups, and private citizens from all sectors of the state. Participants are working to address problems threatening salmon species on a statewide basis. Watershed councils have been created to bring local knowledge into the solutions. Many government agencies administer programs that improve fish habitat. Under this plan, agencies whose activities affect aquatic systems coordinate programs consistent with conservation and restoration efforts. A monitoring program will annually assess progress and roadblocks. * See "Columbia River Basin" for a photograph of a Native American man gaffing a salmon.